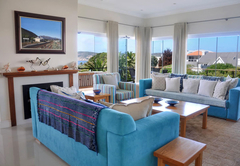 Sondel Beach House is a highly recommended property providing self catering in Plettenberg Bay for up to 10 guests visiting the Garden Route region. 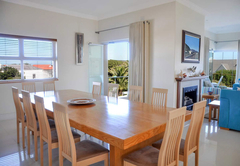 The Sondel Beach House, located in a quiet suburb, is a large luxury holiday home tastefully decorated and situated a mere 160 meters from Solar Beach, Robberg, Plettenberg Bay. 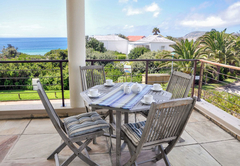 This stretch of coast line falls along South Africa's splendid Garden Route, offering discerning visitors a holiday of peace, beauty and comfort. 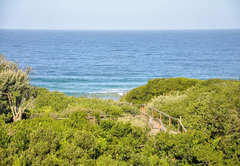 Enjoy the sea views, the Tsitsikama Mountain panorama and listen to the waves crash against the shoreline of the little used beach. 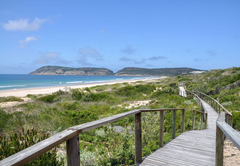 The beach can be reached directly from the house along a wooden boardwalk which opens up to a breath taking 5km stretch of fine golden sand and adjacent safe swimming beaches. 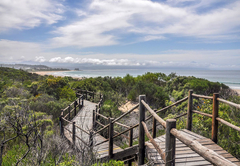 Views run across the bay with the historically rich Robberg Peninsula to the right and to the left the Tstitsikama Mountain vista. 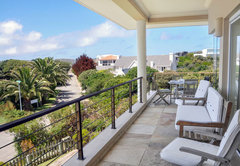 The accommodation consists of five en-suite double bedrooms, fine finishes, large open-plan entertainment areas, barbeques and a solar heated private outdoor swimming pool. 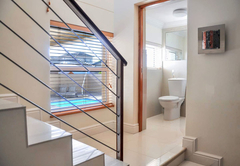 The house is tiled throughout except the bedrooms which are carpeted and have under-floor heating. All bedrooms have ceiling fans, are twin bedrooms while three can be configured with king-size beds. All ten beds are extra length beds. The home is fully alarmed and is linked to a quick response reaction unit. 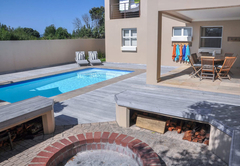 Undercover patio, solar heated swimming pool, wooden decks and an outdoor barbeque area, a second small living room with LCD TV leading to the four downstairs bedrooms, all with en-suite showers while two bedrooms have baths in addition to the showers. 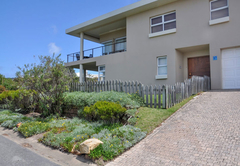 A double garage provides lock-up secure parking for two vehicles and is accessed directly from the home itself. Master bedroom with full bathroom, and spa-bath. 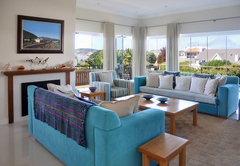 The living area, with LCD satellite TV, opens to a surrounding balcony creating a large entertainment area, with lounge, dining room and granite surface kitchen. 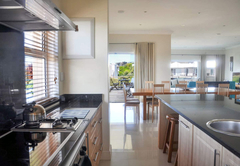 The kitchen is fully equipped, comprising two Bosch combination fridge / freezers, oven, microwave oven, ice maker and reverse-osmosis water filtering system. A separate scullery houses a dishwasher, washing machine, tumble dryer, chest freezer and leads onto an outside under roof drying area. The dining area includes table seating for twelve and has a double door under counter beverage cooler, food warmer and serving area. There are three separate upper deck terraces each facing different directions, one of which has an under-cover built in gas barbeque. 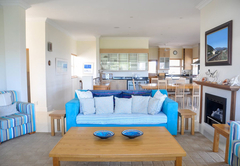 The lounge, dining area and kitchen has under floor heating installed. 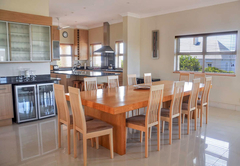 A small breakfast nook, facing north, leads off the kitchen. Wi-Fi is available on the upper floor, the code for which will be provided on arrival. A separate study is available. We wish that it was not a week ago that we were at Sondel and that we were just arriving. Our stay was magnificent. We all concurred that one of the highlights of our week was the house. You have thought of all the comfort alternatives and we were constantly pleased to find another well considered feature. These included the glass door partitioning, the fans, the ability to shelter from any wind position, the gas braai, plenty of cupboard space, surround sound, fridge near the pool, premium DSTV etc... We were also very appreciative of the little extras you had provided like the flowers on arrival, soap in all the bathrooms, toilet paper, salt and pepper, 30 seconds, cards etc. These all make a great difference. Thank you for making your delightful house available to us and I am sure we will be in contact again quite soon. Child policyChildren of all ages are welcome under adult supervision, parents to please note that there is a steep stair case in the house. 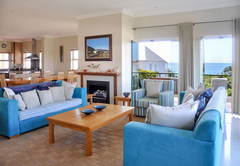 Exceptions to check-in/out times in Low Season may be arranged, please enquire.